In this interview with Kate’s client Sarah, you’ll learn how she’s grown her business (without going online). She works less face to face hours and now takes holidays with her loved ones without losing income. If you would like to catapult your business to a better place and you are sick of feeling stuck and not knowing what to do or how to do it, book a call with Kate today. and creating a HUGE passion project as well as increasing her income. If you would like to catapult your business to a better place and you are sick of feeling stuck not knowing what to do or how to do it, book a call with Kate today. 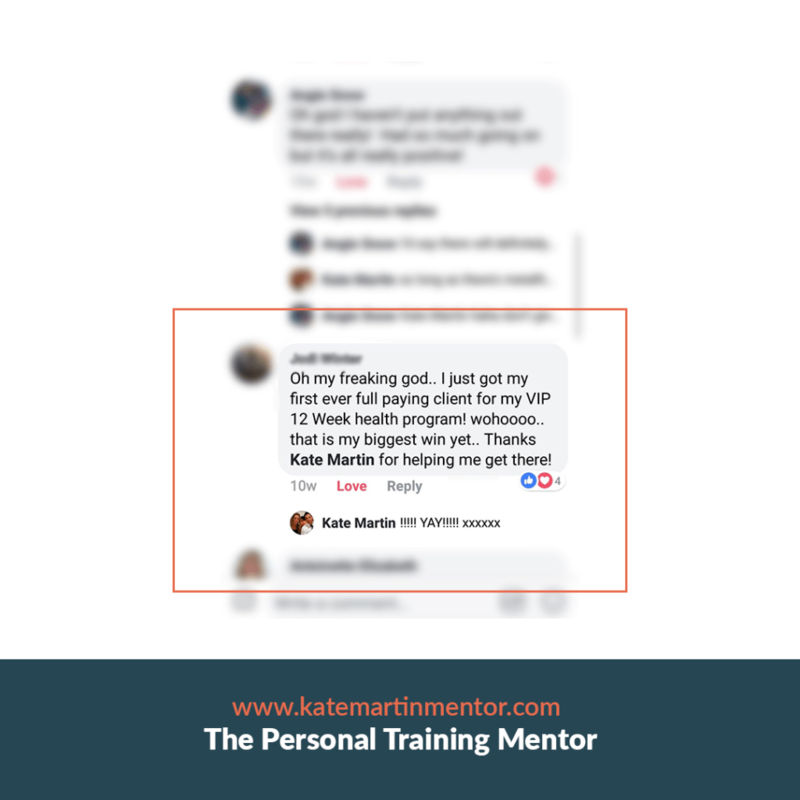 Watch the video to see what she did… If you are sick of not knowing which way to turn in business and would like to increase your income now without going online or doing more hours, make the time to talk with Kate. When we met Sophie she was in overwhelm and wanting to take her business from 1:1’s to groups and fast. She had no time to waste on ‘testing what worked’, as she mentioned. 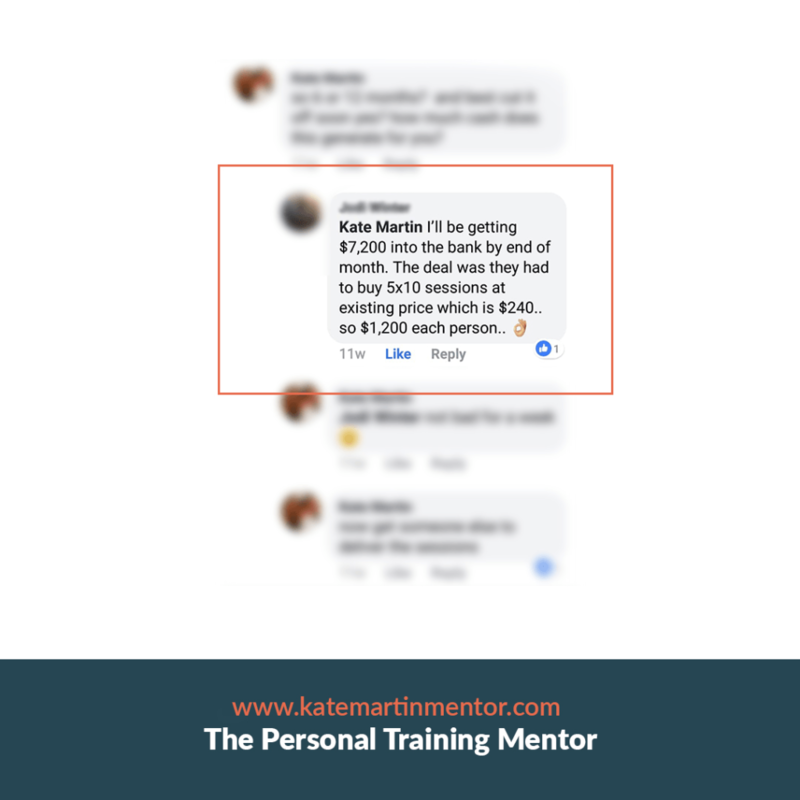 She had come from a corporate background and had set quite a few things up in her business, yet didn’t know how to ‘get the numbers in’ so she could do group training. Hear what she shares about her desire, where she was, what she was looking for, how she did it and what she has created today and looks forward to in the future. If you are operating in overwhelm and know you have what it takes to increase your business but you cannot seem to get past the glass ceiling on your income, book to speak to Kate to see what critical things you could do to quickly change your business and your life. 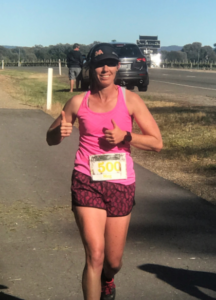 Mother of 3 small boys, Coach, Massage Therapist and Nutritionist Jillian tells her story of going from worrying about income to loving, enjoying relaxed time out with family on a regular basis. 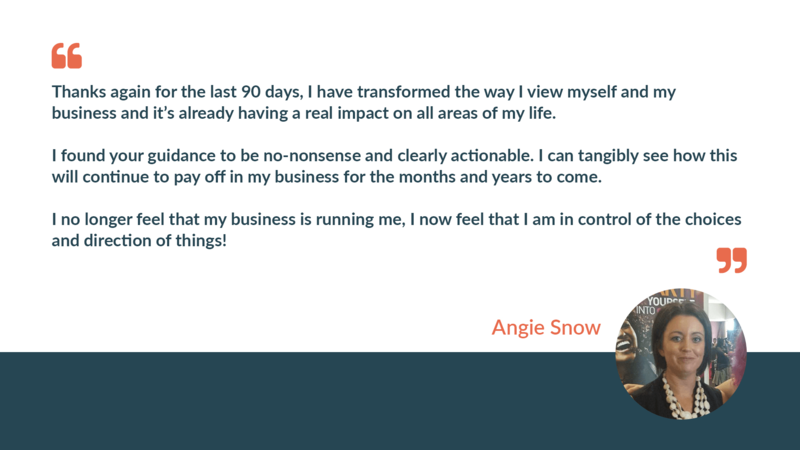 If you are sick of putting up with ‘not knowing where your next client is coming from’, and you’d like to get your business and life to a place where you do not need to worry about that class ceiling on your income any more, book a call to see what might be possible for your business. To find out how this could work for your business book a call with Kate here. From the very first point of contact over the phone to this present moment (6 months later), Kate has been so supportive. She has efficient systems in place for generating leads and I have learnt so much about sales and marketing my business effectively, concepts I was very new to, even though I had had a mentor previously. I have become more confident creating content and putting myself in a position to thrive. To my surprise, I even managed to easily sell a high end package worth over $7,000 within my first 2 months of working with her. I am consistently excelling in generating leads and now maintain a steady, growing income. 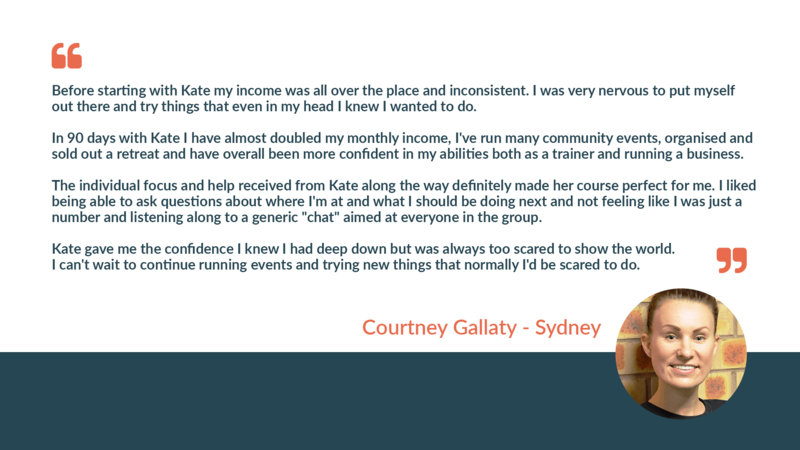 I have seen an incredible improvement both financially to my business and personally within myself as a person from working with Kate. My confidence of how to excel in this career path is now though the roof. She helps turn all my ideas into reality and makes sure that I stay focused on executing them. 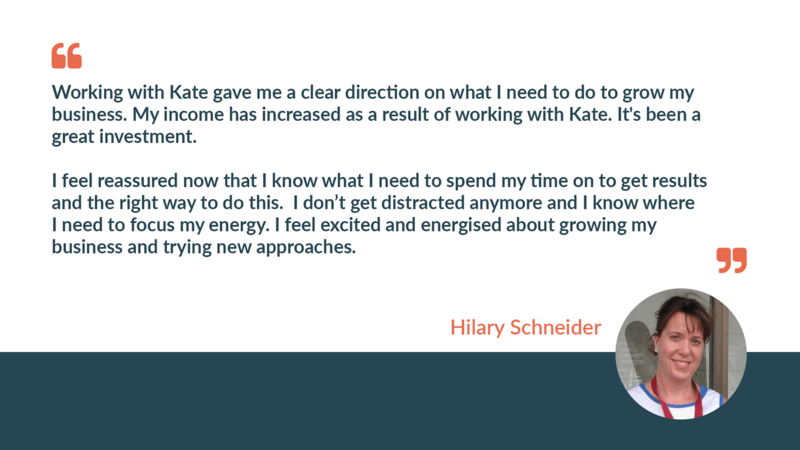 I highly recommend Kate to help you with every aspect of your business, not only professionally but personally as well. I know that with Kate’s leadership I will continue to flourish and grow as a coach and leader in the industry. Meet Megan, a mother of 2 who runs outdoor group sessions. She’d been a trainer for just 12 months when we starting working together. In our first 3 weeks together Megan sold over $10,500 worth of programs. “When I first started working with Kate I was earning $3-400/week. Within the first three weeks I sold over $10,500 in packages”. Fiona has more than 4 x her income. ” I knew I needed a business mentor for a long time. I was ready to give up on my business and defeatedly started looking at 9-5 jobs. Before working with Kate I lacked confidence, had no voice, had no idea about how to tell people what I did, or really have any structure around it. So hickeldy pickeldy. Clients walked all over me. I had no idea how much I was earning, no structures, no plans or packages. It was messy and I was messy. A – I used to work 5 days a week and have barely any clients and stressing all the time about whether to put my business in the can and get a 9-5 job. I had zero structure or packages when seeing a client. I had no rebooking strategy, just thought if they liked what I did they would rebook. I didn’t do much work on the business because I didn’t know how. Even though I didn’t have many clients I didn’t have a great work/ life balance. Now when I work i’m working smart: 3 days is amazing and my work/life balance is perfect for my current situation. I work Tuesdays, Wednesdays and Thursdays – all days are packed out. A – haha. Let’s say from giving up on my business to now being fully booked and charging $175 per hour on my days. Plus 2-3 days my sub contractors work, plus products. Let’s just say I’m very happy financially and love going on 1-2 overseas trips a year. Q – Where are you projected to ‘get to’ in terms of annual income in the next 12 months (at this current rate or just what you see possible)? A – I got to speak with Kate 1 on 1 with to give me my weekly dose of kick-up-the-bum. The main take-away’s were that there’s definitely no separation between ME and my business. It’s not only a journey for the business but you learn about yourself and change who you are for the better. There were extreme moments of tears and joy. So being a life changing experience is definitely something I’ve taken away. On more of a business note it’s being confident that I’d know how to start business from scratch again and get it up and running quite quickly. I’m so much more confident and now have fun at connecting and meeting new people and “boasting” about my amazing services. It’s exciting when there’s clarity. With clarity comes so does passion. BUT always after our chats I felt like Wonder Woman and could totally take over the world. Q – Do you believe the course was value for money? A – Definitely. I was broke when I met Kate and still managed to do it. You have to spend money to make money. Spend it with Kate is money well spent. One of the best business investments I’ve ever made. Q – How did you find the material / actions you were instructed to ‘action’? A – Some of it was “omg I can’t believe I didn’t think of that” …other parts took me right out of my comfort zone, which I needed. The instructions are easy to follow. She lays it out and repeats it a few times to make sure you’ve got it, and she gives you more than you have time to do so you’re never left with nothing to do. Q – How did you find the level of support during and after the course? A – I contacted Kate a few times out of the blue when I was panicking and she replied and made everything ok. She’s there. She loves her customers. There’s so much value added. Q – Where do you see yourself going with your business (or anything to do with servicing clients) in the future? A – I still love face to face work, but I’m looking at getting into teaching anatomy down the fascia pathway and opening up my own big premises after my wedding mid 2019. Then I need to think about having the business running itself for when babies happen a few years down the track! Q – What are you doing with your business now? Employees, your qualifications etc, How do you currently service your clients and structure your week? I have 2 sub-contractors: all massage therapists and looking to getting a PT in ASAP. People are going absolutely nuts for the fascia work at the moment – I can be booked out 6 weeks in advance. Which I’m still thinking “HOLY MOLY” when comparing it to what I used to be like. Qualifications are Grad diploma in exercise physiology, CHEK Practitioner, Structural Integrator and Diploma remedial massage therapy. Q – How did you find Kate, as a person and coach, to deal with? A – Kate and I are opposites. I’m a shy introvert and love marketing with the written word. Kate goes down the public speaking, seminars and workshop pathways OMG KILL ME! haha. We butted heads a few times, sometimes just in my own head and not out loud to her. But I haven’t been mentored from her for about a year now and we keep in touch regularly. I still ask her questions every now and then. We had a long chat together about a potential big business move. 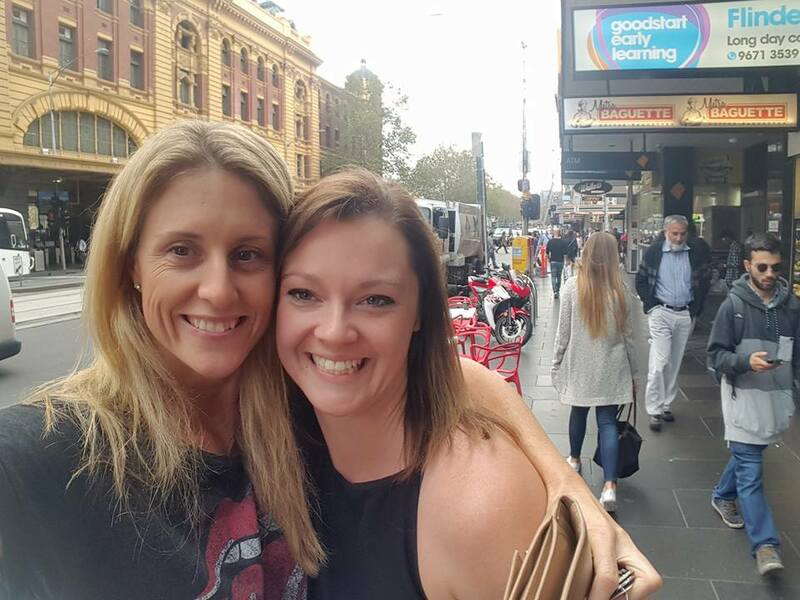 If I visit Melbourne or she came to Sydney I’d definitely want to catch up. She’s amazing. Everyone should have at least one chat with her and you’ll be hooked. A – Already have to plenty of people. Join the free Facebook group to grow your business.